Henning Larsen is the founder of Henning Larsen Architects, an international architecture and Scandinavian design firm. The company was founded in 1959 and employs 150 people from 11 different nationalities. Henning Larsen is best known for his monumental buildings such as the Ministry of Foreign Affairs in Jeddah, Saudi Arabia, or the Library of Gentofte in Denmark and the University of Trondheim, Norway. Whatever the project, the goal of Henning Larsen is to provide sustainable solutions for the user. 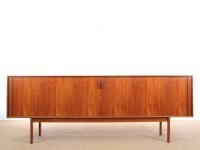 Mid-Century Modern scandinavian sideboard in teak by de Ejner Larsen.